Good knowledge of Java data types is important to write Java programs, both easy and tough and that's why I suggest you to spend some time learning about data types in Java. Even though choosing the right data type for the task is a little bit tough and require some experience, you must first know what are your options are. If you know about all data types in Java, you are more likely to choose the right data type. Choosing the wrong data type can result from an incorrect program and subtle issue especially in the real world application where production will have a lot of data. One example of this is choosing int data type to represent an id rather than long because the range of integer is not enough for many real-world Java application. Similarly, if you can live with float then using double will cost you 4 extra bytes which can be a lot of memory if you multiply with the number of times you use it. Btw, if you are new to Java and just started learning, I suggest you join the Complete Java Masterclass course on Udemy which is both comprehensive and up-to-date. 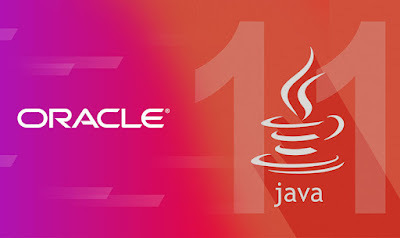 It is also recently updated for Java 11.
there are a couple of other ways but these three would be more than enough to complete the task, hence we'll only focus on these three examples. So, make sure you do a null check before calling toString() method on Integer object. Remember, we are dealing with the object here and not primitive int, which can never null. You can further see Complete Java Masterclass course on Udemy to learn more about String and Integer data type in Java. The course is now available in just $10 on flash sale which is seriously cheap. Remember, String concatenation is replaced with StringBuilder append() call internally. 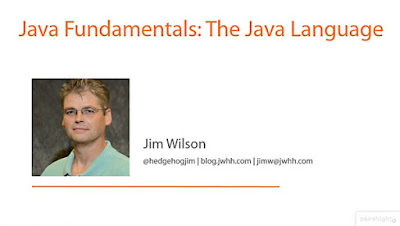 You can also go through the Java Fundamentals: The Java Language to learn more about how JVM work out String concatenation and how Java compiler helps there. This is the third example of converting an Integer to String in Java, but unlike other two this involves autoboxing. As shown in the earlier article about converting an int value to String, you can pass an int primitive when you use %d as format instruction, and this result in String equivalent of integer passed as shown below. You can see, here we need to pass an int variable but now since we have an Integer object, it needs autoboxing. 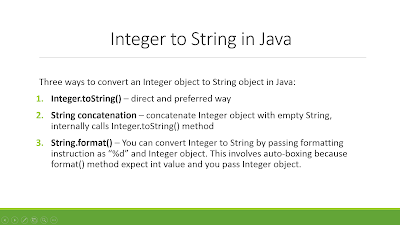 That's all about how to convert an Integer to String in Java. As you have seen, the most straightforward way is to use Integer.toString() method, it doesn't need autoboxing and it's a direct way to get String from Integer. Alternatively, you can concatenate Integer object with empty String. This will internally call the toString() only. The third way is just for information purpose though it useful, its purpose is different. You should use String.format() to produce a formatted String not to convert an Integer to String. Thanks a lot for reading this article so far. If you like this tutorial then please share with your friends and colleagues. If you have any questions or feedback then please drop a note. If you like to stay updated, you can also follow me on twitter, my id is @javinpaul. Hello Dawid, yes you can also use String.valueOf() to convert Integer to String, but mindful that's also involves auto-boxing.